Your standard entry ticket to the Sunset Cinema. Adult > Permits entry for one adult into the general admission area for the one session. Concession > Permits entry for one concession card holder into the general admission area for the one session. Accepted concession cards include: full-time student, seniors and government issued pension or health cards. Child > Permits entry for one child into the general admission area for the one session. Child must be aged between 3 & 12 y.o. Family > Permits entry for 2 x Adults + 2 x Children into the general admission area for the one session. Additional children require a Child ticket. Family ticket can also be used for 1 x Adult + 3 x Children. GA tickets are available online up until 7 pm each screening night or at the Box Office from 7 pm(subject to availability). You can add seating hire to any GA tickets when booking your tickets online or hire on-site (subject to availability). All tickets subject to booking & transaction fees at the point of purchase. Entry Terms & conditions apply. Great value & a great option but be quick as there are limited Lawn Lounge tickets available each screening night! Lawn Lounge tickets are only available online. All tickets subject to booking & transaction fees at the point of purchase. Entry Terms & conditions apply. Sunset Cinema is best enjoyed with friends plus it’s cheaper ? 4 or more for $15 each – save 25%! Groupies tickets are only available online. Larger groups click here. All tickets subject to booking & transaction fees at the point of purchase. Entry Terms & conditions apply. Street parking available. In addition Ridge Street Carpark is a couple of minutes walk away. An accessible entrance is available on Ridge Street, outside the Bob Stand. North Sydney Oval is a non-smoking venue. We’ve got the tummy covered with…. The ‘movie must-haves’ like freshly popped popcorn, chips, chocolates & lollies. Popular market food vendor ARISTAN FLAME joins the Sunset Cinema in 2019 at North Sydney Oval to serve up a delish menu tailored to outdoor cinema. Check it out HERE. In a first for Sunset Cinema, we’ve teamed up with MENULOG who have rounded up the Top 3 nearby restaurants to offer up their best dishes to Sunsetters. Orders must be in by 5:30pm – so order up before you arrive & then sit back & relax as Menulog delivers it to the Oval. All the details & menus HERE. Don’t forget you can also pack your own picnic just like the good ol’ days ? Water & juice pop tops also available. Sunset Cinema is fully licensed. No-BYO alcohol is permitted. The gold standard in outdoor cinema seating, these full length loungers are the most luxurious way to soak up the Sunset Cinema atmosphere. Extra beany, these generously sized beanbags are a cosy, comfy way to take in the film. Available in kids & adult sizes. Like good ol’ fashioned beach chairs, these comfy little numbers let you lean back in style while keeping your backside clear of the ground. If you’ve got the perfect outdoor cinema cushion, picnic rug or the like feel free to bring it along. 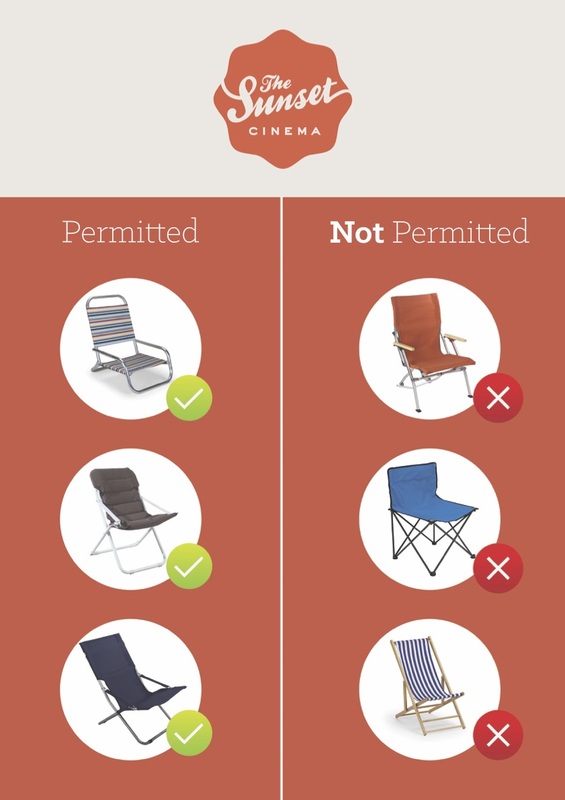 If you’re bringing camping chairs or similar which could block other’s view, you’ll be asked to setup towards the rear of the seating area. Seating with pointed legs is strictly not allowed at North Sydney Oval.